In “101 Wines to Try Before You Die” (Octopus Books, April 2018), British wine writer Margaret Rand explains how her selections are not the most iconic or highest scoring — although some are both — and the number assigned to each is random. She says, “Instead, they are the wines that, when I have had the chance to taste them, have given me the greatest pleasure.” With a description of each wine, the variety and producer, the pages also offer advice on the best vintages and dishes for pairing. A glossary and wine-by-variety index makes it easy to explore. Looking for Oregon? Check pages 168 and 170. 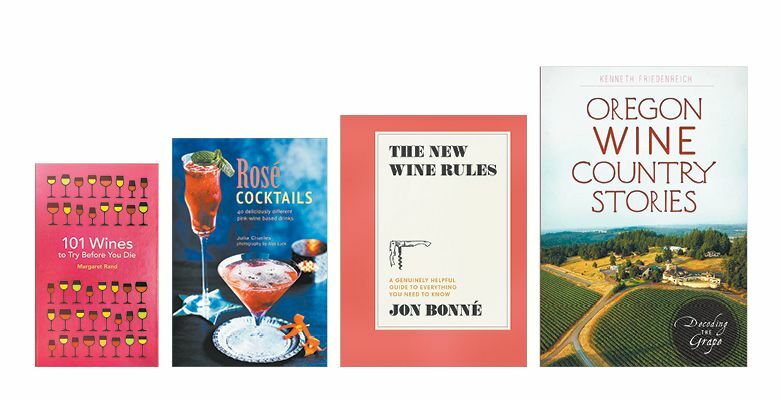 In “The New Wine Rules: A Genuinely Helpful Guide to Everything You Need to Know” (Ten Speed Press, November 2017), Jon Bonné, currently the senior contributing editor for PUNCH (punchdrink.com) and formerly the wine editor of The San Francisco Chronicle, taps his years of experiences to untangle the world of wine for every level of understanding. The book offers refreshing advice — a wine’s price rarely reflects its quality; drink rosé any time of year; don’t save a great bottle for anything more than a rainy day — in simple, easy-to-digest tidbits accompanied by beautiful illustrations from Maria Hergueta. With the arrival of the “frosé” — a slushie-style concoction of fruity rosé blended with strawberry syrup — blush-based cocktails are on the rise, and author Julia Charles is here to help. In the simply named “Rosé Cocktails” (published by Ryland Peters & Small, May 2018), 40 recipes with stylish photography give the home bartender a lot to drink about. From elegant sparkling aperitifs to sophisticated sippers to tooth-tingling icy treats, Charles offers suggestions for every occasion and taste. OWP contributor Kenneth Friedenreich can now add author to his résumé. “Oregon Wine Country Stories: Decoding the Grape” (Acadia Publishing/The History Press, April 2018) contains his new collection of musings about the Oregon wine industry. He describes his work: “This is a memoir, a panegyric to drink as commercial and social ecology, laden with some lore and describing transitions from modern founders to their heirs and successors. The book is more meditation than buying guide, more observation than how-to, but these elements are necessary as they are both useful reminders and fun to write about.” Alongside essays, find black and white photos, both historic and current, plus labels, maps, a list of wineries and an index.